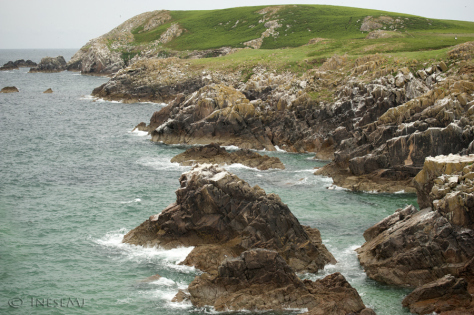 I have been to Saltee Island again. I thought I would re-blog my two old posts before I share some new photographs with you. Never too many puffins for me 🙂 Hope you enjoy the trip! I reviewed you previous blog and while awed by the birds, it’s always the land and water that touches my heart. Place a bit of land, rugged rocks and wide open crashing waves — count me in. Rocks, waves, and cliffs will get me every time. The years we lived along the central coast of California [Big Sur, Monterey, Carmel] were not only the best years of my life personally and professionally but also the most beautiful. I could hear those crashing waves all day from my office and all night from home. I love that rustling sound when the sand and pebbles are moving with the tide. Music to my soul. Wonderful location and awesome photographs! Thank you! I was there again yesterday – this is the season when the Puffins are feeding their young with the Sand eels. I will reblog another old post before I share my new photographs. What an amazing looking place. Thank you so much for sharing this, Inese. 🙂 I enjoyed imagining the owners and the shelter they’ve provided. My imagination is really going with this post. Mega hugs! Thank you for your comment! I was there yesterday, and will post some new photographs next week, but I thought I would reblog my old posts so that I don’t have to explain everything again 🙂 The place is a paradise. Thank you again! Hugs!!! Thank you! Went there again yesterday. A paradise.